Home / Brooklyn / Brooklyn GOP / Brooklyn GOP Radio / CPAC / Finding Mr. Righteous / Gene Berardelli / Lisa De Pasquale / People's Republic of New York / Russell Gallo / WED@9PM - Finding Your Right ("Wing") Valentine & More! WED@9PM - Finding Your Right ("Wing") Valentine & More! If you thought that all we had going on was CPAC prep, you, my friend, are sorely mistaken! 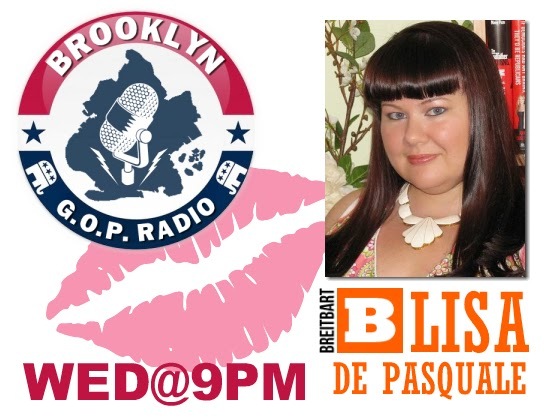 Brooklyn GOP Radio is going to have a great show this Wednesday - and this time, it's all about the ladies! Breitbart's Lisa De Pasquale will join us to talk about her latest article giving advice to young women trying to find "Mister Right" who is also "Right Wing". Now before you starting thinking that we went all "Etiquette Class" on you, this is actually pretty cool - the article is a primer for Lisa's book coming called Finding Mr. Righteous hitting real and virtual shelves on February 25, which details her dating experiences in DC and the many challenges conservative women face along the way balancing career, religious beliefs, dreams, life and love. But before we get to all that, we'll commemorate President Lincoln's birthday, discuss the latest news on the NY Governor's race (including Westchester County Exec. Rob Astorino's remarks at the NY Meeting and the latest on the Donald! ), Mayor Di Blasio's State of the City speech and a whole lot more of the news you can use! Going to talk about that as a lead-in to the segment. Thanks!